TIP: You can save products to your favorites list if you log in December and January can be a tough time for roasters who are waiting for harvests from around the world like kids awaiting Santa. Fortunately there are offerings like our Papua New Guinea Kiam, a very recent arrival to the ‘States, from our partners Genuine Origin/Volcafe. 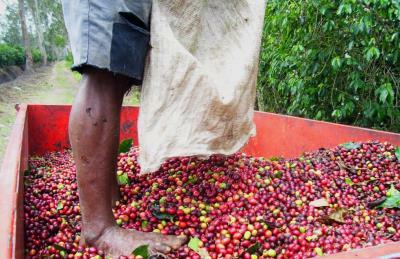 “The Far East” designation as a producing region is vast and unpredictable…nothing like occupying the “Ring of Fire”…but PNG coffees are reliable and sweet and full of surprises. This coffee popped out on the cupping table amongst Ethiopians, Peruvians and Colombians and we had to have it. Paul Pora is the producer of this Typica/Bourbon/Arusha varietals polyglot from the Eastern Highlands, Jiworka Province, a region of great biodiversity and volcanic soil. Grown at 1650 meters and fully washed and sun-dried. 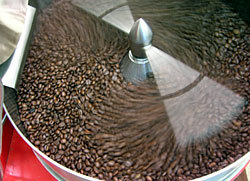 Big-bodied like most PNGs, lemon-limey, grapey and caramel sweet in our medium roast. Very fine French Press and espresso at our medium roast. 1 lb. bag $14.50 lb. "I LOVE YOUR COFFEE! Thanks for the honey process sumatra suggestion. I've never been disappointed yet. Yum, yum, yum. "